It can be seen that there are numerous parameters that can be varied to achieve the best selection. The usual practice is to base selection on the annual energy output of the plant and the cost of the corresponding installation. The following points should be considered while selecting right type of hydraulic turbines for hydroelectric power plant. High specific aped is essential where the head is low and output is large, because otherwise the rotational speed will be low which means cost of turbo-generator and powerhouse will be high. On the other hand there is practically no need of choosing a high value of specific speed for high installations, because even with lo specific speed high rotational speed can be attained with medium capacity plants. Rotational speed depends upon specific speed. Also the rotational speed of an electrical generator with which the turbine is to be directly coupled depends on the frequency and number of pair of poles. The value of specific speed adopted should be such that it will give the synchronous speed of the generator. The efficiency selected should be such that it gives the highest overall efficiency of various conditions. In general the efficiency at part loads and overloads is less than that with rated (design) parameters. For the sake of economy the turbine should always run with maximum possible efficiency to get more revenue. When the turbine has to run at part or overload conditions Deriaz turbine is employed. Similarly, for low heads, Kaplan turbine will be useful for such purposes in place of propeller turbine. The installation of water turbines of reaction type over the tailrace is effected by cavitations. The critical values of cavitations indices must be obtained to see that the turbine works in safe zone. Such values of cavitations indices also affect the design of turbine, especially of Kaplan, propeller and bulb types. Experience has shown that the vertical shaft arrangement is better for large-sized reaction turbines, therefore, it is almost universally adopted, whereas, in case of large size impulse turbines, horizontal shaft arrangement is preferable. a) Very high (350m and above): for heads greater than 350m, Pelton Turbine is generally employed and practically there is no any choice except in very special cases. b) High heads (150 m to 350 m): in this range either Pelton or Francis turbine may employ. For higher specific needs Francis turbine is more compact and economical than the Pelton turbine that for the same working conditions would have to be much bigger and rather cumbersome. c) Medium heads (60 m to 150 m): a Francis turbine is usually employed in this range. Whether a high or low specific speed would be used depends on the selection of the speed. d) Low heads (below 60m): between 30m to 60m both Kaplan and Francis turbines may be used. Francis is more expensive but yields higher efficiency at part loads and over loads. It is therefore preferable for variable loads. 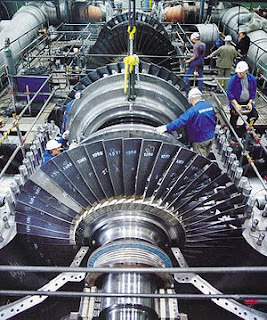 Kaplan turbine is generally employed less than 30m. Propeller turbines are however, commonly used for heads up to 15m. They are adopted only when there is practically no load variation. Quality of water is more crucial for the reactive turbine the in reaction turbines. Reactive turbine may undergo for rapid wear in high head reactive turbines.